To blind bake, fold a sheet of baking parchment in half, then thirds, and then draw around your cutter on the top face. Cut your folded parchment along the line of the circle created by drawing round your cutter thus cutting out 12 circles at once. Pop one parchment circle on top of each pastry case and weigh it down using baking beans (not baked beans) if you have them or use uncooked rice. After cooking the pastry blind for 12 - 15 mins, take off and discard the rice and parchment and return to the oven for a further 2 - 4 mins, until the cases are slightly golden. Whisk the egg whites in a free-standing mixer until soft peaks form when the whisk is removed. Add the caster sugar a little at a time, still whisking until the meringue is stiff and glossy. Add the cornflour and whisk again. 3. 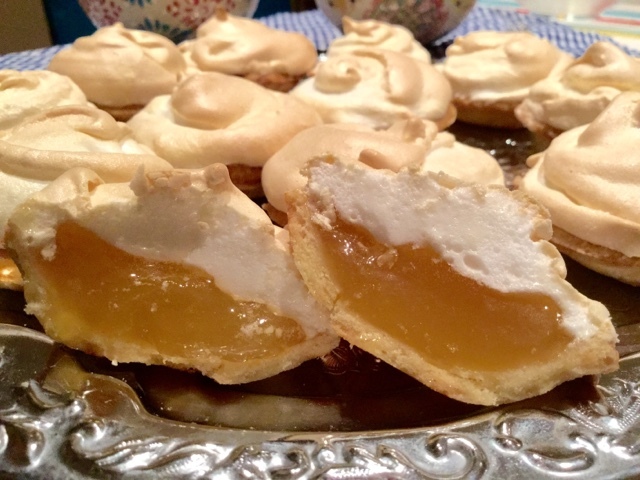 Bake in the oven for about 10 - 15 mins, until the filling is completely set and the meringue is lightly golden and crisp. Warning: these pies are so darn cute, they're almost too sweet to eat. Good luck.